A pool shade cover will transform your pool with color and style while providing valuable shade from the intense summer sun. A strategically placed sun sail, umbrella or pergola will provide shade for anyone swimming in the pool or lounging on the poolside deck. In addition to providing relief from the sun, shades lower the temperature around the pool so it can be enjoyed on even the hottest days in July and August, or December and January in Australia. If you've ever gone for a swim or lounged poolside only to cut it short because it was just too hot or you were worried about harmful UV exposure, a pool shade cover is something worth serious consideration. If you have children you can also take comfort knowing that you are limiting their UV exposure while providing a much more enjoyable (and safer) swimming environment. With all the pool shade cover designs and options on the market today there is something that will work perfectly with your pool. The best part is that most of the options are very affordable and DIY-friendly so you don't need to pay someone to install it for you. If your goal is to provide shade for the pool, patio, keep the pool area temperature lower during the day or just to add some color to the backyard there is literally something for every situation. We'll go over each type of pool shade cover including benefits, installation process and cost and even go over how they compare to each other. A pool shade cover sail is a modern and stylish way to shade your pool area from the hot sun. The affordability and array of vibrant color options have led to their growing popularity in the United States and Canada after having been a popular choice in Australia for many years. The numerous shapes and sizes make them suitable for almost any size pool area from small residential pools to large commercial aquatic centres. A shade sail can be attached to a sturdy freestanding pole made from wood, metal or fibreglass. It can also be attached to a house and hung in layers to achieve seamless shade or even vertically to stop wind and evening sunlight. High quality polyethylene materials are often used that provide UV protection, wind protection and even water proofing. The options really are unlimited when it comes to transforming your patio into a creative and practical work of art. Pool shade sail installation should start with preplanning where you would like to place the sails including size, color and shape. You should keep in mind the path and angle of sun during the hottest summer months in relation to your pool and patio usage. 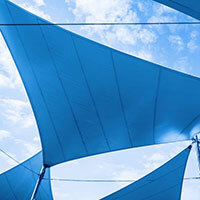 If you want to achieve more shade, sails can be overlapped or you can use one large shade to cover a very large area. The height of the shade sails is important when planning the pool shade cover sail installation. You will need to use free standing poles high enough to achieve the proper height. The poles should be set in concrete or a sturdy place on your existing house or pool structure. A sun shade sail installation kit is recommended for any installation to ensure that the sails are held in place properly. If you live in an area that experiences strong winds you may need to remove the sails on occasion. If the sails are installed properly you will reduce the likelihood of the sails coming loose or becoming a problem. It's something you can try to plan for and incorporate into your design if you foresee wind being an issue. When comparing a pool shade cover sail vs umbrella there are a few things worth considering. A sail shade is ideal if you want a permanent structure and don't mind putting in the time to set it up right. Many owners have added value to a home or business. Shade sails can provide protection from the wind and rain in addition to the sun, depending on the material used and how they are installed. 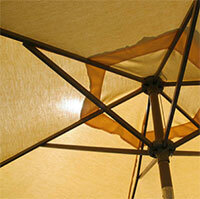 A patio umbrella may end up costing slightly more than a sail shade but they are a lot easier to set up. They often come as a part of a package with a table and chairs so you can work it into your patio ensemble. They can be moved around easily and many are able to be tilted, so you can adjust as the sun moves across the summer sky. Umbrellas can be susceptible to high winds and often need to be taken down during heavy wind storms. The pool shade sail vs pergola question comes down to aesthetics and possibly how much room you have around your pool. A shade sail can be installed just about anywhere and doesn't take up any ground space, while a pergola requires an area large enough for it to stand. 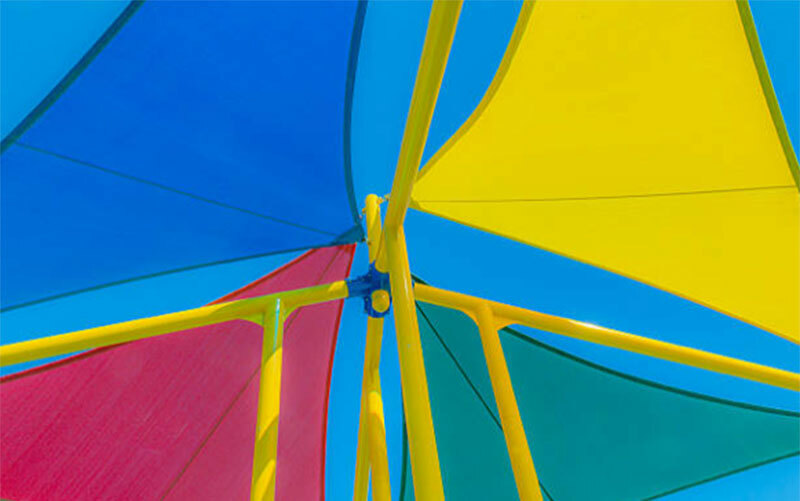 Sails can be found in many vibrant colors that liven up a pool or patio area. 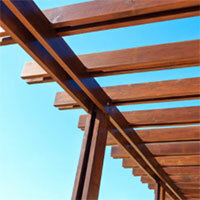 A pergola is made out of wood or synthetics, generally in earthy or dark colors. A sail shade or several sail shades will cost substantially less than a pergola. If you build your own pergola you reduce your costs but it will still cost more for a pergola vs sail shades. Sails will provide cover from the sun, wind and rain while a pergola will only provide relief from the sun at certain times of the day. The most common form of pool shade cover has got to be patio umbrellas and for good reason. They have been a popular choice for decades because of their versatility and ability to provide shade wherever needed. Umbrellas are available in a wide assortment of colors so you can either add bold bright colors to your pool deck or neutral colors to fit in with an existing color scheme. Patio umbrellas usually come with a base and stand and even a table and chairs. Entire packages can be purchased for a very affordable price so you won't break your budget. While free standing umbrellas offer increased versatile with how portable they are, there are in-pool umbrellas that can be set up as a permanent structure. They can be a great addition for both practicality and will even add to the aesthetics of your pool area. A poolside pergola can completely transform your pool area while providing valuable shade. The amount of shade can be increased by adding a roof, a sail or even growing vine plants. It's again up to your creativity and budget and how comfortably you are doing it yourself. There are many different designs that can be purchased as pergola kits or you can take the DIY approach and construct your own exactly how you want it. While shade pergolas are found in many shapes and sizes, they can also be built out of just about anything. The most common material is cedar because it's lightweight, looks great and is affordable. A cedar pergola next to a pool can transform the feel of any pool from plain to exquisite for a very affordable price. It can be fun to add accessories like furniture, lights or pool art. Pool shade cover trees are another great way to add shade and privacy to your backyard pool area. Trees are an investment in both money and time, as it will take several years in most cases for a tree to mature and reach full size. It's important to do research before planting poolside trees so you're aware of root tendencies as well as if, and how much they shed leaves. You may want to consider a leaf net in addition to your inground pool cover if you end up going this natural route for providing pool shade cover.